In this presentation, drawing from their book, Football’s Secret Trade – How the Player Transfer Market Was Infiltrated, Alex Duff and Tariq Panja will explain how the international football player transfer market, in theory a market designed to ensure the orderly transfer of players between clubs that both protects competition integrity by restricting movements to two periods a year, and rewards developing clubs through transfer fees and training compensation payments, has increasingly become a platform for speculative money flows by investors with frequently little interest in the health of the game of football, or that of the football industry. The dramatic rise in both the number and total value of transfer fees paid (See FIFA TMS, January 2017, and CIES, September 2017) has served to draw an increasing number of such investors into transfer market investment. FIFA’s banning of the Third Party Ownership of players was a recognition of the dangers that such player investors might pose to the health of the football industry. But as Alex Duff and Tariq Panja will explain, investors have devised other increasingly imaginative strategies to profit from the player transfer market, for example, by acquiring teams purely as a vehicle for transfer market speculation. In this presentation Alex and Tariq will explain the realities of how such strategies are implemented, and the implications for football’s stakeholders – players, clubs, leagues, governing bodies, supporters – of this increasingly influential investment trade. ALEX DUFF is a senior communications expert for FIFPro, the international football players’ union. He has worked as a reporter for UK newspapers and Associated Press in Rio de Janeiro and Bloomberg News in Madrid. TARIQ PANJA has worked as a reporter for the Manchester Evening News, Associated Press and Bloomberg News in London and Rio de Janeiro and currently works for the New York Times. Duff, A. & Panja, T. (2017). 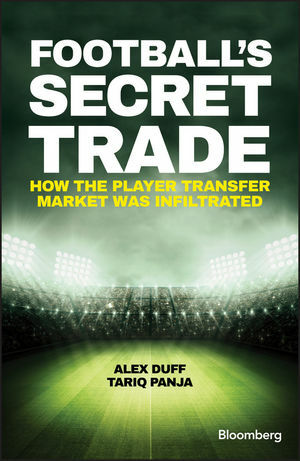 Football’s Secret Trade – How the Player Transfer Market Was Infiltrated. John Wiley & Sons.